Blacktop Cowboys chronicles the 2004 rodeo season through the eyes of several steer wrestlers trying to make it back to rodeo's version of the Super Bowl, the National Finals Rodeo (NFR) in Las Vegas. Steer wrestling is an adventure that entails riding into an arena at 25 mph, sliding off a horse while taking hold of a 500-pound steer, and then throwing the animal to the ground. The best cowboys often accomplish all this in less than four seconds. The two main characters of Blacktop Cowboys are Luke Branquinho, a young carefree cowboy on a quest for his first title, and his best friend, Travis Cadwell, a veteran trying to make the NFR one last time. Much of Blacktop Cowboys unfolds in trucks, trailers, arenas, behind the chutes, casinos, beds and everywhere else cowboys spend their time. 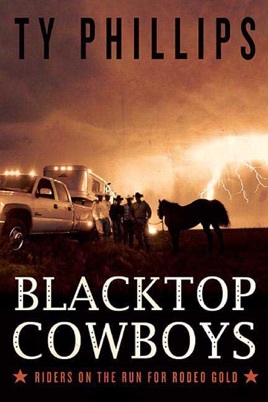 By taking the reader deep into the cowboys' lives, Blacktop Cowboys offers a true and intimate portrait of men having the time of their lives while living on the road in pursuit of the dream to be the best. With gritty tough-guy prose and an unerring eye for details that capture the guts and frailty of the human condition, Phillips has crafted an enthralling tale of the modern bulldogging cowboy. A reporter for the Modesto (Calif.) Bee, Phillips spent a year on the road with "one loose-knit band of cowboys, mostly steer wrestlers" during the 2004 Professional Rodeo Cowboy Association season. From the dusty arenas of Norco, Calif., and Cody, Wyo., to the glitzy, sexed-up Strip in Las Vegas, Phillips centers this rip-snorting yarn on Luke Branquino, a tobacco-chewing, womanizing up-and-comer from California, and Travis Cadwell, an old-timer trying to find the glory one last time. In Phillips's powerful language, Branquino is big in body and character, and on the endless rodeo circuit he drinks, wrestles thousand-pound steers to the ground and makes it with the ladies with equal abandon. In the harsh reality of the arena, the aging Cadwell "felt like he was embarrassing himself... a new and entirely ugly feeling." This is a raunchy, insightful delight. 16 pages b&w photos not seen by PW.